After the Chambray I bought for my planned Colette Laurel turned out to have a fault (and subsequently turned into a Hollyburn Skirt) I had to come up with a plan B. I had three metres of this Navy Cotton Eyelet in my stash (I also bought some Teal and Purple at the same time, couldn’t decide which I liked best so had to get them all!) 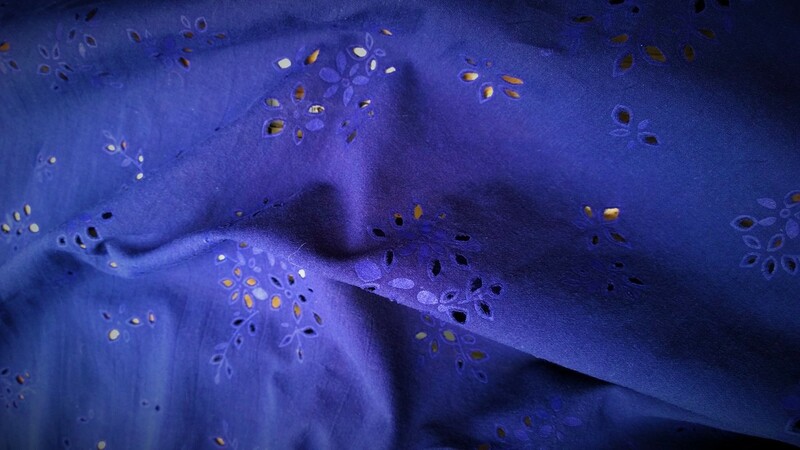 It’s not embroidered like normal Eyelet but seems to have been laser cut with flowers printed around the cutouts. I’ve had a cotton Laurel on my list for a while now but it kept getting bumped down. The Summer Stashbust is really making me look at what I’ve got and finally getting around to putting past plans into action. 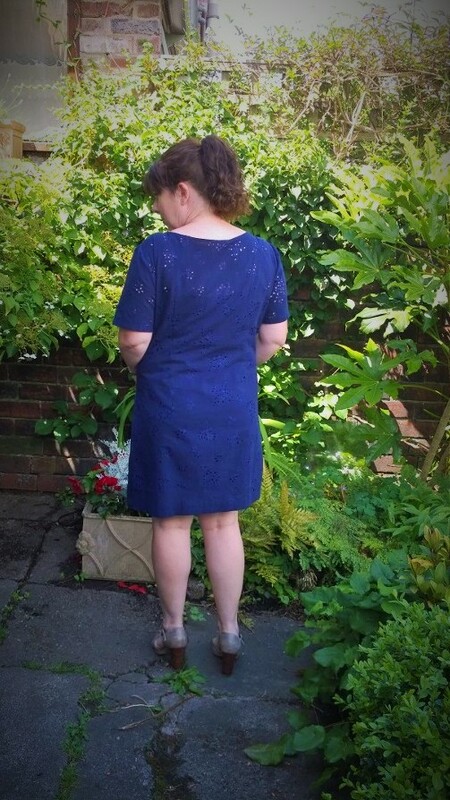 I’ve made two Laurels previously, the first was a Royal Blue and Black Polka dot knit version which has become a ‘pottering around the house dress’. The second was in some Green Polyester which felt horrible but I really loved the colour! 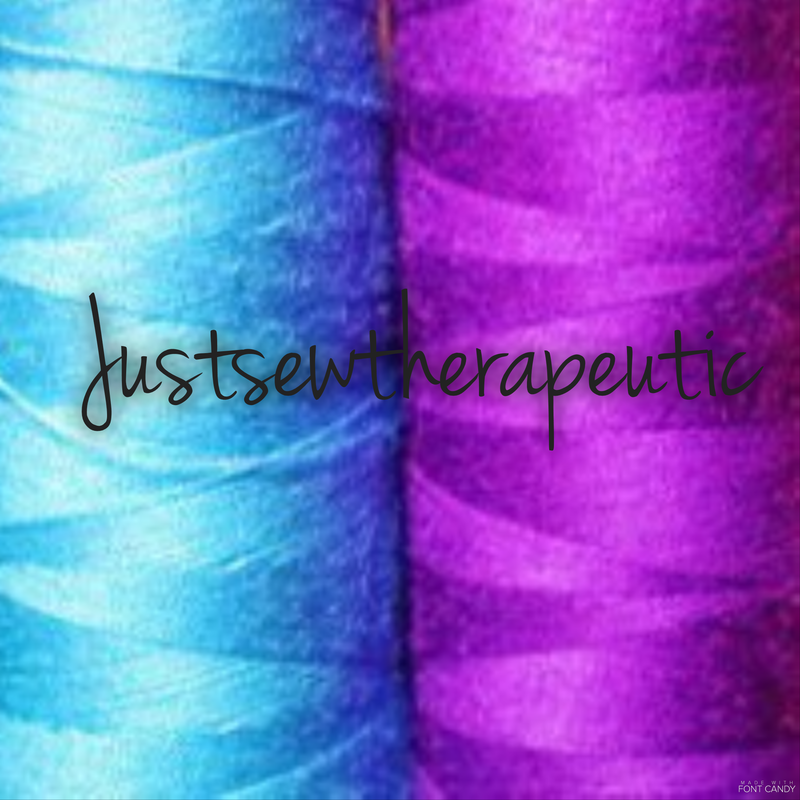 Both of these didn’t do the pattern the justice it deserved, it really needed to be Cotton. I cut a size 12 and managed to get out of putting a zip in by cutting the back piece on the fold, I had done this with my previous ones and it worked well. The first step was to put on the patch pockets, I’ve got a cardboard template I use which is about 1cm smaller than the pocket, I just fold the fabric over the template and iron it into shape. I shortened the sleeves by around 4 inches and squared off the last 2 inches so I could hem them rather than using bias tape. 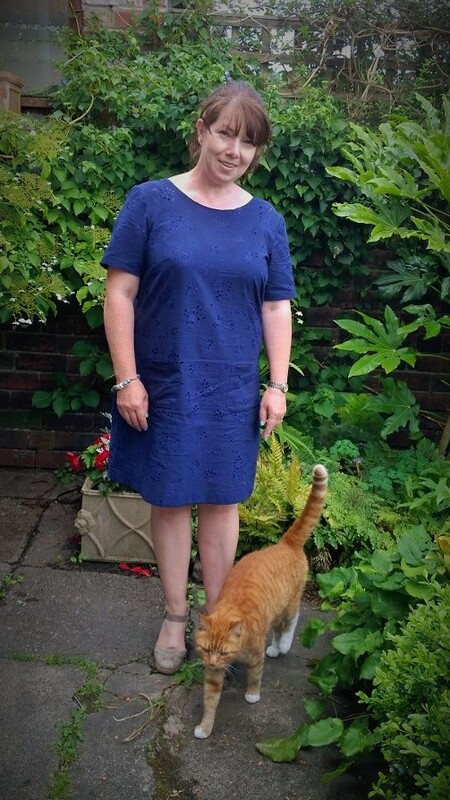 Once I had sewn the side seam I tried it on to check how much I could realistically take off and still be able to get the dress over my head, I repeated this, stitching a centimetre further in each time, until I got to the point where I could comfortably wriggle into it! It was only then that I finished the seams with my overlocker, I have been so careful not to get carried away with it after my last brush with danger! 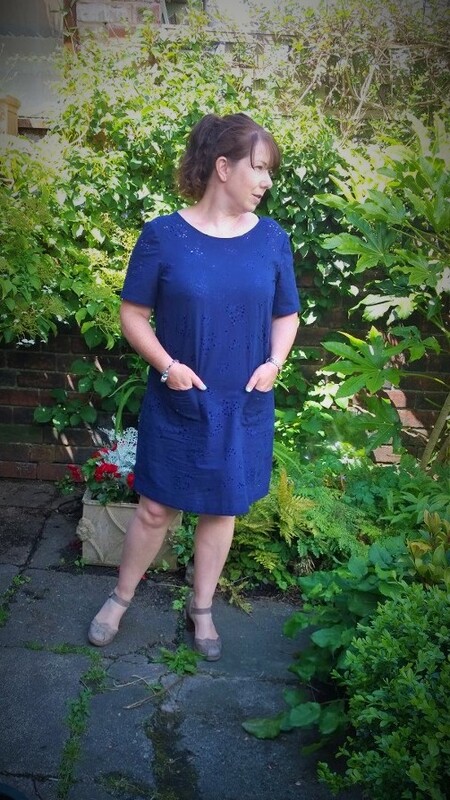 I finished the neckline with readymade bias tape which I had in my stash, I was trying to conserve fabric and managed to squeeze it out of a metre and a half, so I still have a metre and a half left for something else! I gave it a two inch hem to take my short stature into account and it falls just above my knees. It does however ride up a bit when I am sitting down and bending over is a complete no go! I wore a Navy slip underneath to preserve my modesty as I didn’t want any peekaboo moments through the eyelets. It is however a perfect summer dress as it has built in ventilation and the breeze just flows through those cutouts! 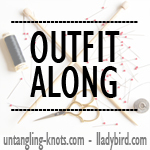 How are you doing with your Summer Sewing? Have you had any me made wardrobe malfunctions? 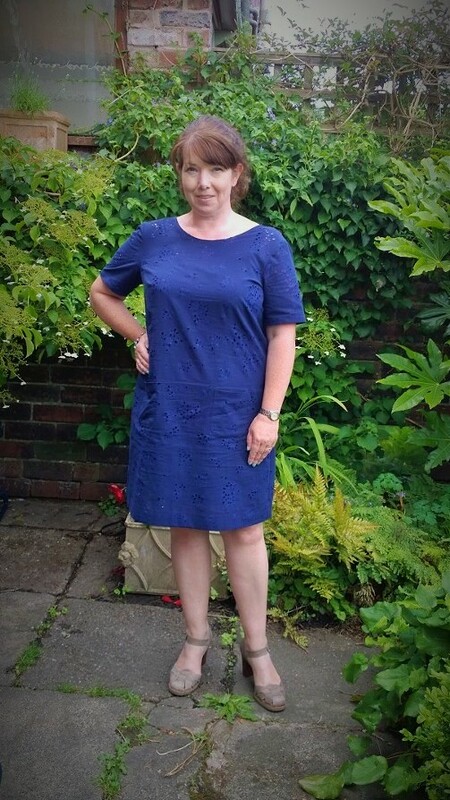 This entry was posted in Finished Sewing Projects and tagged colette laurel, Cotton eyelet, memadeeveryday, summer stashbust 2014. Bookmark the permalink. The perfect summer shift, the fabric is gorgeous. It really is a great pattern, I’ll definitely be making more! 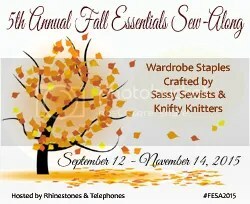 Great use of great fabric!! 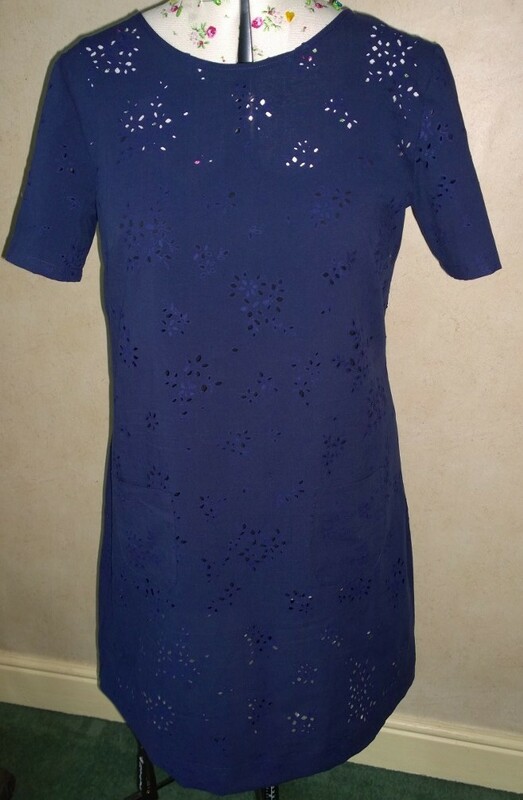 I love eyelet cotton, fab dress! This is beautiful! 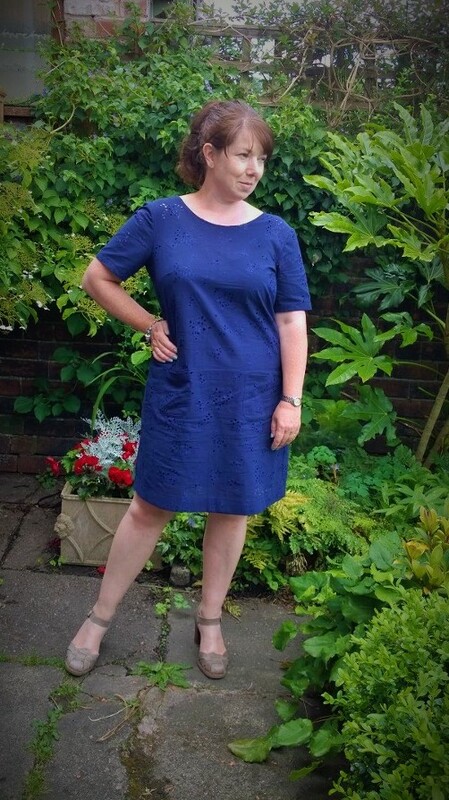 I recently fell in love with this pattern but haven’t really been happy with my pockets – it looks like your placement is higher than mine and I like it a lot! I’ll have to try again. Lovely make! I think it is tricky getting the placement right with patch pockets, I tend to place them a bit higher as I’ve got short arms. It is a lovely pattern though, I really need to make more!